Lending to friends and family can be difficult. Not using a written agreement can result in confusion about when the money should be repaid and with how much interest, or a loan could be mistaken as a gift, either by the borrower or other family members or friends. A written agreement may seem too formal - especially if it is written in a legalistic style. It may prompt the borrower to question your relationship and whether you trust him or her. This loan agreement is a simple agreement that aims to bridge the gap between not using an agreement at all, and using a longer, more comprehensive one. This is a simple agreement. It contains no provisions for security or for a guarantor. If you need these, look at our other Loan agreement templates or see the most likely alternatives below. However, it is a legally binding document and you can take action against the borrower if he or she doesn't pay you on time, or uses the loan for a reason not agreed. 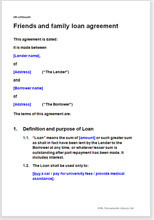 Use this agreement when you need to record the loan, but where you have a high level of trust with the borrower. Either party may be abroad or in New Zealand, and the loan can be of any size. If you need a more comprehensive agreement, but are happy for the loan to be unsecured, see our standard Unsecured loan agreement: person to person; private or business. If you need a guarantor, then see Loan agreement: person to person; secured by guarantee. There is little specific statutory law relating to personal lending, so you are free to agree the terms you want with the borrower. We give you options for different situations. Drawn outside the Credit Contract and Consumer Finance Act 2003, this agreement is not suitable for companies in the business of lending or providing credit to consumers. This template is supported by drafting notes so that you will know whether you can safely delete some provision. It is most unlikely that you will want to add new provisions, but if you do, it is easy. Our layout and use of plain English also make it very easy to edit by deletion.